What is the "Secret to Ice White Pomeranian's ? research shows that the gene that controls the white color in Ice White Pomeranian's is a natural component in the total color genetic makeup of the Pomeranian breed. ARE Ice White Pomeranian's ALBINOS? The Ice White Pomeranian should have dark (preferably black) skin pigment. The nose, lips and eye rims should have color and be completely filled in. The skin of the entire muzzle may be dark as well. This dark skin will often show through the coat on the top of the muzzle. While totally black points are preferred on an Ice White Pomeranian. The fact of the matter is ....most Ice White Pomeranians will not display the perfectly black noses and eyeliner! Why you say! The reason is , the bright stunning Ice White color is the result of 2 Sp genes . When a Pomeranian tests Homozygious for the Sp gene not only are the chances VERY GOOD. That you will get a completely white Pomeranian that is much brighter than a normal white Pomeranian. The chances are also increased that pigment will be affected. That is why totally black eyeliner and noses are so highly desirable for a true Ice White Pomeranian . Now on to a different subject . It is commonly believed that all albino animals will have milky or chalky white skin pigment, light eyes with pink or red pupils and colorless, white hair such as you might see in the common lab mouse. In many species, including humans, albinos do exhibit these physical characteristics. However, today we recognize cases where albinos will exhibit colored (non-white) coats and blue eyes. (The so-called "white" Doberman Pinscher is such a case.) They are properly known as "Tyrosinase-Positive" or partial albinos. OKAY… IF AN ICE WHITE IS NOT AN ALBINO, THEN WHY ARE THEY WHITE? The coat color comes from a simple recessive gene. 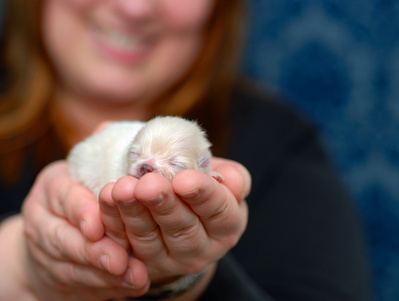 To put it plainly, in order to produce a white puppy, both parents must carry the gene for the white coat color ! New research has shown that the white gene is not associated with the genes that cause color-paling in the Pomeranian Dog, since those genes are located at different loci. It is possible that an Ice White Pomeranian could carry these dilution genes. However, since the dog is white in color, the paling factor would not express itself in the color of the coat. A lot of Pomeranian puppies are born " white" or we should say , what looks like white. That does not mean that they will stay white. Pomeranian's are color changers ! You may have one that is born a very dark color that looks almost like a black puppy . Later that puppy will lighten up and have a lot of Silver , grey or even creme in the coat as an adult . Or you may have a puppy born totally white , even bright white and that same puppy will turn out Orange as an adult ! A very desirable color in Pomeranian's is Creme Sable . Sometimes these puppies will be born very dark and as an adult look almost pure white , not a bright white but a soft creamy white. For this reason understanding the color genetics behind Pomeranian's is very important to a breeding program that is interested in producing certain colors . must have the following genotype: ww. (A non-white dog would have to be either WW or Ww.) If we breed our Ice White Pomeranian ( ww ) , the only gene it would be able to contribute to its offspring would be the recessive ( w ) . So keep in mind an Ice White Pomeranian bred to ANY other color will always pass on one ( w ) gene to each and every one of its off spring ! Guaranteed !! homozygous for the gene pair ( ww ) responsible for producing the color Ice White . If you breed two Pomeranians together that you think are both Ice Whites and ANY of the resulting puppies are any other color than Ice White then you have not bred two TRUE Ice Whites together . The only way to know for sure 100 percent positive that you have a TRUE Ice White Pomeranian is to have it Genetically tested . You may have heard the term "phenotype" which describes the physical appearance of an animal. Thus, the phenotype of an Ice White Pomeranian that inherits the ( ww ) gene pair will be that of a solid BRIGHT white dog , with BLACK pigment on the nose , lips, paw pads and eyes. The problem with the phenotype is that what you see isn’t always what you get. In many cases, you can’t tell a given dog’s genotype just by looking at its phenotype. For example, a black and tan Pomeraian could be homozygous for non-white (WW). Such a dog would be unable to produce a white puppy, even if bred to a white dog because it doesn’t carry the recessive white gene. However, a black and tan dog could be carrying the gene for solid white (heterozygous for the white gene pair) and you would never know it just by looking at him (his phenotype) because the dominant W ‘covers up’ takes precedence over the recessive partner gene. will produce a litter of non-white, non-carrier puppies. Likewise, two white Pomeranian's homozygous for ( w) bred together can never produce a non white puppy. We can use a simple punnet square to determine the probability of producing white offspring from a white parent x non-white parent if we know the genotype of the non-white dog. In the first punnet square, we see the potential result of breeding two carriers together. (We’ll define a carrier as a non-white dog that carries the white gene, also known as white ‘factored.’) With this mating, there is a potential for 25% of the resultant litter to be white (ww), 25% to be homozygous non-white (WW) and 50% to be heterozygous non-white (Ww – carries the white factor). In example 2, we mate a carrier (white factored or Ww) to a white partner (homozygous ww). The potential exists for half the litter (approximately 50%) to be white while the other 50% will be white factored (heterozygous) like their non-white parent. In the third example, we breed a homozygous non-white dog to a white partner. None of these puppies can be white but all of them have inherited the white factor and can produce white when bred to another carrier or to a white partner. In the fourth example, we breed a white factored dog to a homozygous non-carrier. Again, none of these pups can be white but half of them (approximately 50%) could potentially carry the white gene. The other 50% would be homozygous non-carriers. or do a test breeding to a white dog, . If no white pups result, then you would know that the parent is probably a non-carrier, or homozygous for WW. This is a very simplistic explanation and does not account for the actions of other genes at other loci. But it should help explain how and why the white color can be carried along for several generations without expressing itself and then suddenly appear in a litter of Pomeranian puppies. There has been so much research into the WHITE coats on dogs that this subject can be totally confusing , especially when you consider the different opinions as to what produces WHITE coats in dogs........ One noted researcher Sheila Shultz says ....."Samoyeds, are typically white. We have genotyped only 3 Samoyeds but interestingly all were "e/e" at MC1R and also "a/a" at the agouti locus. .................. Sue Ann Bowling suggested we study such dogs. Are they white because the don't make black pigment in their hairs because of "e/e" and also can not make red pigment because they are "a/a"? There could be yet another gene involved, but this is a very intriguing hypothesis. Genetic research has, at least partially, identified the actual genetic hair color regulation mechanism behind white and cream colored coats in several breeds of the domestic dog. Research has shown that a recessive ‘e’ allele at the Extension (E) gene is at least partially responsible for cream and white coat color. The (E) gene, now identified as the Melanocortin-1 Receptor (MC1R) gene, is one of the two genes known to code for alleles that are absolutely fundamental to the formation of all white Dog colored coat variations. hen the ‘e’ allele is inherited from each breeding pair parent, the e/egenotype offspring of certain breeds, including white coat dogs from German Shepherd breed lines, always have cream or white colored coats. A genetic scientist researching the genetic coding of cream and white colored coats concludes in a related research paper that, "Because cream [and white] dogs always have an e/e genotype at MC1R, DNA testing for an ‘e’ allele should be predictive that the dog is heterozygous for cream [and white] coat color in breeds such as Akita, Caucasian Mountain Dogs, German Shepherd Dogs, Miniature Schnauzers, and Puli." Breeders of standard color only German Shepherd Dogs and White German Shepherd Dogs# may wish to test their breeding pairs for the ‘e’ allele to better refine their respective breeding programs as to coat color. White coat hair appears when one or more regulator genes cause hair follicle melanocytes to inject no melanin pigment granules into the hair fiber as it is formed in the follicle structure. One of the most quoted books on dog genetics and coat color is "The Inheritance of Coat Color in Dogs" by Clarence C. Little, first published by Comstock in 1957. Several editions of Little's book have been published in the intervening years and most other books that discuss dog genetics and coat color are based on Little's work. Little's genetic research is based on hypothesized alleles with hypothesized dominance at hypothesized gene loci to fit data obtained by observing and categorizing coat colors and color patterns appearing in various dogs breeds and litters. Little's work continues to serve as the foundation of understanding for the determinants of coat color, but genetic science is starting to show where Little was right and where he was wrong. Modern genetic research now reveals that for some observed traits, or phenotypes, like coat color, the actual genetics are different from those hypothesized by Little and others. Little (1957) hypothesized that dilution or partial albinism ce, ca and cch alleles of the so called (C) gene caused the cream and white coat color variants in domestic dogs. Locus (C), commonly referred to as the albino and paling gene, was historically used to explain the cream and white coat color variants of many species. For dogs, Little hypothesized that a possible cch (chinchilla) allele of the (C) gene pales phaeomelanin to cream, that a second possible allelece dilutes phaeomelanin to white and a third possible allele ca causes pure albinism in homozygotes. Little's 1957 hypothesized explanation for cream and white colored coats has been applied across many domestic dog breeds, including white coat dogs from German Shepherd breed lines. Most genetic researchers now map the so-called (C) gene to the tyrosinase (TYR) gene because albinism has been found to be the result of various genotype mutations at this locus in mice, humans, rabbits, cattle, and cats. The TYR locus is known to encode for tyrosinase, an enzyme that ultimately leads to the formation of the two natural melanin pigments eumelanin and phaeomelanin within melanocyte cell membranes. The most frequent form of albinism results from genotype mutations at the TYR locus that cause the tyrosinase enzyme to malfunction such that eumelanin and phaeomelanin production is retarded to varying degrees or fully eliminated. Over 100 different mutations within the tyrosinase gene are now known to cause the most frequent form of albinism genetically labeled as oculocutaneous albinism type 1, or OCA1.2 The specific mutations that encode for pink-eyed albinism in the domestic dog have not yet been identified through genetic testing. A research project at the University of Saskatchewan Genetic Research Laboratory has, at least partially, identified the actual genetic mechanisms behind white and cream colored coats in several breeds of domestic dog, including white coat dogs from German Shepherd breed lines. This research laboratory also searched for and has not found tyrosinase malfunction in white coat dogs common to those breeds. Little's 1957-era tyrosinase malfunction dilution or partial albinism explanation of the C locus ce, caand cch alleles, as applied to explain domestic dog white and cream coat colors, therefore, can be replaced by the findings of modern genetic research.